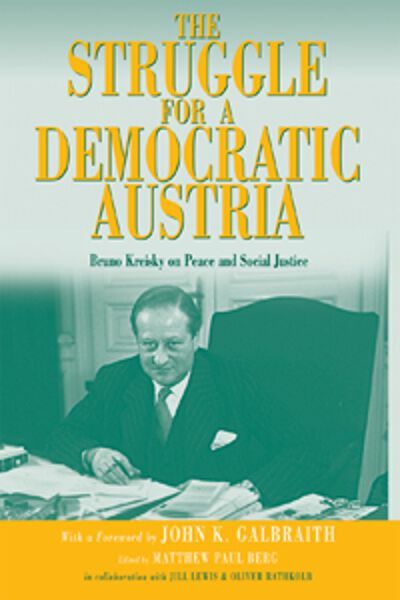 Bruno Kreisky (1911-1990) is undoubtedly the most prominent and influential politician to emerge in postwar Austria. For some thirty years, he helped to shape his country's politics and raise its status in the world, first as secretary of state, then as leader of the opposition Social Democratic Party and as foreign minster, and finally as chancellor from 1970 to 1983. During his long tenure of public office, Austria achieved unprecedented levels of prosperity; he promoted electoral and educational reform and weathered the occasional scandal. His analytical mind and intelligence were much appreciated by statesmen in East and West as well as in the academy, as were his deeply felt humanism, integrity, untiring advocacy of tolerance and social justice, and his earnest sense of responsibility. These won him the trust and admiration of the leading international figures of his era, including Tito, Nehru, Nasser, De Gaulle, and Pope John XXIII. His international connections and his position as leader of a non-aligned state allowed him to assume the role of honest broker in international peace, human rights, and development initiatives. His stature enabled him to play an active part in the promotion of the Arab-Israeli dialogue and pave the way for President Jimmy Carter's mediation of the Israeli-Egypt peace accord through his close relationship with Sadat. As a result of such activity, Kreisky was respected and praised by every U.S. administration from Kennedy to Brezhnev, despite his support for the containment of Soviet communism. This annotated volume - a condensed version of the three volumes of the German edition and compiled by Jill Lewis, University of Wales, and Oliver Rathkolb, Director of the Stifung Bruno Archiv - gives a fascinating insight into Kreisky's life and his many activities. He lets us participate in the big decisions in which he was involved and shares his encounters with other world leaders of this time. Austria be a small country, but it produced at least one major leader whose lively and immensely readable account and wisdom many readers will find inspiring. Matthew Paul Berg teaches in the Department of History at John Carroll University. BENEFIT FOR THE LIBRARY: This book will be a valuable addition to the library's collection. REFERENCE: I will refer to this book for my research/teaching work. STUDENT REFERRAL: I will regularly refer my students to the book to assist their studies. OWN AFFILIATION: I am an editor/contributor to this book or another book in the Series (where applicable) and/or on the Editorial Board of the Series, of which this volume is part.